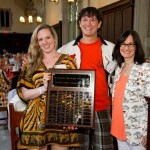 The Class of 2009 won three Reunions awards and one Class Dues award for Reunions 2014. These awards were accepted by class officers at the annual Alumni Council Luncheon on Friday, May 29th, 2015. 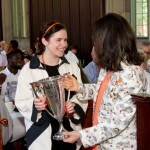 Our class won the 1921 Plaque and the 1901 Cup for Reunions 2014! 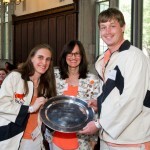 The 1921 Plaque is awarded to the class having the largest number of classmates (846) present at a major reunion, and the 1901 Cup is awarded for having the largest percentage of classmates in attendance (72%) at a major reunion. 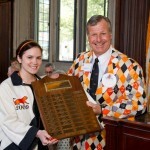 We received the Class of 1960 Quenby Cullen Williamson S60 P89 P91 Award for having the most imaginative P-rade costume at Reunions 2014. Translation: our lederhosen and dirndls were a BIG hit! We also won the 1941 Plaque for the highest percentage of dues payers in a class more than one but less than 25 years out of Princeton, with 37%. We previously won the 1941 Plaque in 2010 after our 1st Reunion, with 58%. 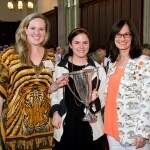 2009 won two other Reunions awards for our 1st Reunion: the 1894 Bowl for the largest percentage of classmates in attendance (54%) at an off-year Reunion and the 1915 Cup for the largest number of classmates (661) present at an off-year Reunion. 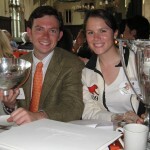 Mike Monagle (Class Treasurer) and Jackie Thomas (Reunions Chair) with the 1894 Bowl and the 1915 Cup at the Alumni Council Luncheon in May 2011.